Cette 1800 pieds carrés maison joliment meublées et récemment rénové, est l'endroit idéal pour un moment de détente merveilleux à Sunriver. A, calme, situation calme et ensoleillée, dos à la piste cyclable de la rivière Deschutes à distance de marche et également près de North Pool & Woodlands golf. Vous pourrez vous détendre sur le pont supérieur ou faire tremper dans le jacuzzi sur le pont inférieur plein sud avec vue dégagée. Avec un salon au 2ème étage, et la salle familiale au niveau inférieur idéal pour les familles et les adultes. mises à jour plus récentes à cette maison comprennent: nouveau jacuzzi @ 014), tous les nouveaux lits, de nouveaux meubles, nouvelle télévision grand écran dans le niveau inférieur. I have left a review but happy to do it again! Fabulous house, especially for a family with children. The lower level has easy access to the hot tub, a large TV, family room area, large bedrooms and bath. Upstairs was perfection for adults—-large, spacious areas, lovely deck, good kitchen. This house takes dogs and has nice walking paths all around and is on a safe street. We would rent this house again and again!! Owners are lovely and accommodating! 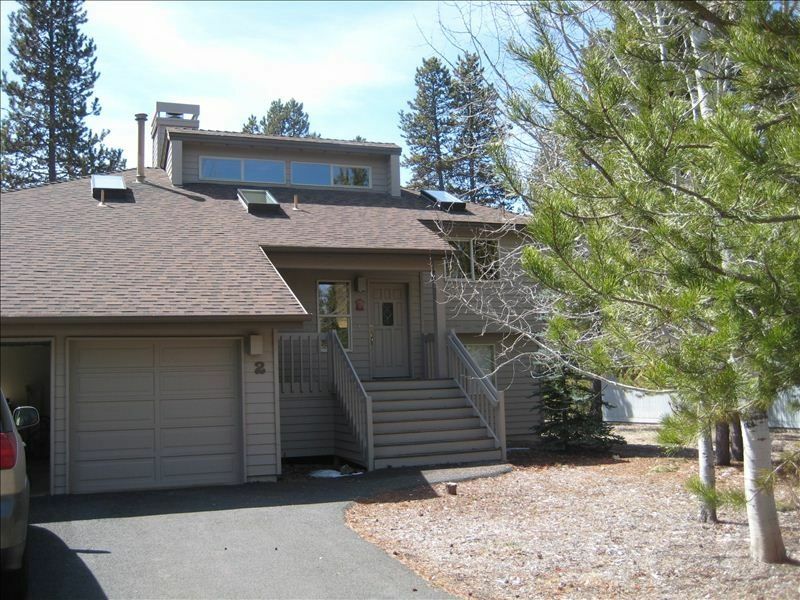 We shared this home in the north part of Sunriver with another couple and found it worked well since there was a king bedroom and bath on the main (upper) floor and two bedrooms (queen and twins) and a bath on the lower floor. We had unusually hot weather and used the fans which were supplied but spent the majority of the time when we were in the home in the family room on the lower floor which stayed beautifully cool. The home was supplied with everything we needed and the beds were comfortable. The home adjoins a bike path and the neighborhood was quiet. Evenings sitting on the back deck once the sun went down were perfect but bring insect spray if mosquitoes love you like they love me. Everything was very clean with the exception of the white carpeting which would be hard to keep clean in any home. Thanks, Sue, for your prompt responses to questions and clear instructions on everything. Thanks so much for the review. I really appreciate it. It is true, the carpeting really took a beating this year. We had it cleaned July 10th and when we returned in August noted lots of spots everywhere. It is set to be cleaned again. I'm so glad you enjoyed your stay at our home. We had a great time at the property. There are some reviews here that are concerned with the upstairs getting warm because there is no air conditioning. It is true. During the day, the upstairs can get warm. But, the upside to that is the when you open the windows in the evening and leave them open during the night, in the morning you get to wake up to a beautiful, cool, clean Central Oregon air. The mornings made it all worth it. Besides, it was never unbearably hot inside. I wish I could make this a 4.5 star review. The only reason it is not a five is because the property is off circle 6. I never knew where we were staying. Honestly, I still can't tell you where in Sunriver it is other than it is a ways from the Village. Without my WAZE, I would never have been able to find my way to and from but that may just be me. Again, there is an upside there as well, it is nice and quiet and peaceful. Everyone in our group had a great time. Maybe add some SHARC passes but that is not that big of deal. All in all, pretty great stay. Thank you so much for your review. I appreciate your positive comments and am glad you had a good time. Your right the upstairs can get a bit warm at times but the great thing is Sunriver always cools down. Our place is ~3 miles from the village so for those who want to be close to the action it probably is not a good fit. It is very peaceful at our location and I find I appreciate that more and more. Beautiful home. Bathrooms are very nice. The only drawback was having only 2 burners to cook Christmas dinner on (grill side of Jenn-air doesn't work.) Note: the TV shown in the living room picture is gone, but the downstairs TV is great; so only 1 TV in the house. Wonderful location, close walk to river, and short drive to stores and SHARC. Owners very responsive. Would return! Clean and comfortable in a beautiful setting. Thoroughly enjoyed our stay. Loved the ambience of this home. Kitchen well supplied so that eating in was easy. We would return.